As a new mom, I have often wondered how I can engage my toddler with fun Bible stories. I have learned that this is not an easy task! Thankfully, I am learning about the beauty of teaching my child with a Montessori style. 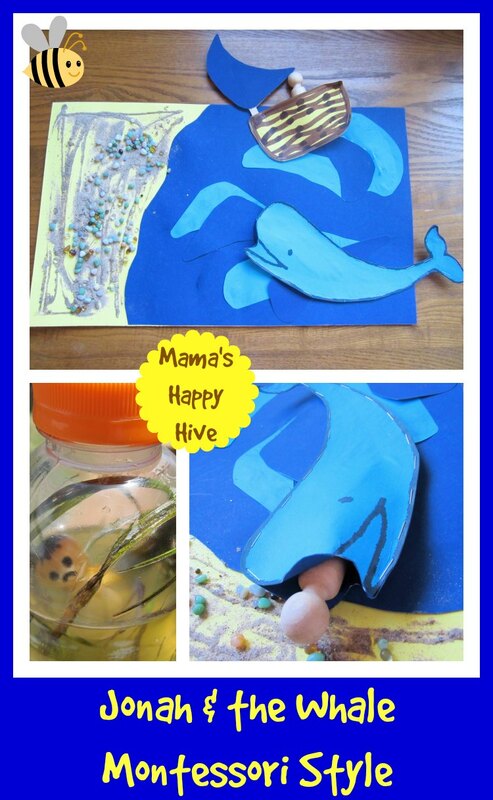 So my creative side starting clicking its gears and I was able to think up this fun "Jonah & the Whale" activity. Little Bee is really enjoying this craft. I hope your little ones will enjoy it too! I took two Gatorade bottles with one blue flavor and one green flavor. The green sensory bottle is to represent Jonah inside the whales stomach. It was not a pleasant place to be! The Bible says that Jonah had seaweed wrapped around his head. In the green liquid sensory bottle I put some "real" pond grass/weeds and a few rocks at the bottom. I also took a wooden peg person, tapped a nail into the bottom of it and put it inside. I tapped a nail onto the bottom of the peg person to keep his head upright. Lastly, I drew a sad face on Jonah with a magic marker before placing him inside the bottle. 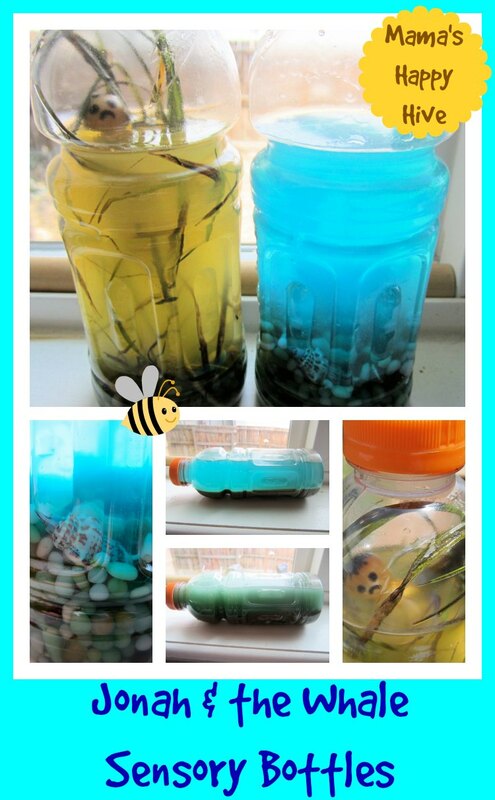 In the blue liquid sensory bottle is some pretty shells, little rocks, and sand. This bottle is to represent the ocean and when the bottle is shaken, it gets cloudy. The color actually changes to a dark green. I like to shake the bottle when telling the story about when the storm came over the ocean while Jonah was in the boat running away from God. I made a whale, little boat, with a backdrop of sea and land. 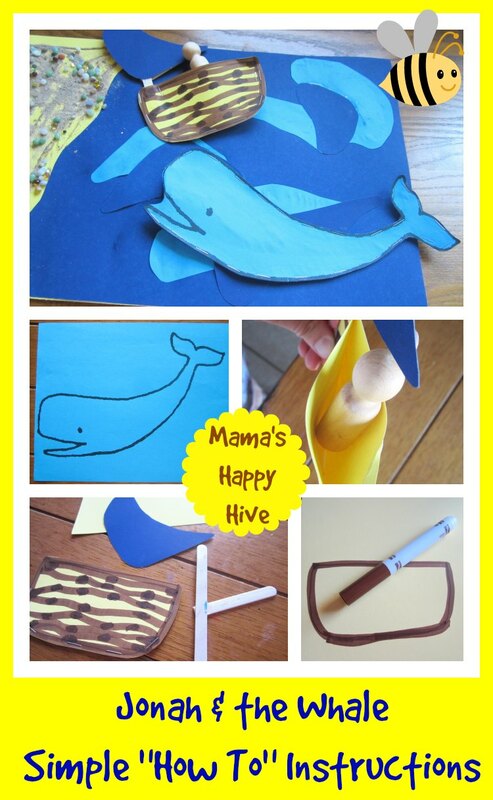 Here are the materials that you will need to make this fun craft. I found the whale outline here at www.supercoloring.com. I printed the whale on regular letter sized blue paper and enlarged it 175% to get the right size. I cut the whale out and glued it onto thick poster board paper. I made a front and back of the whale out of poster board and then stabled the sides except for the mouth area. This created a pocket for Jonah to fit into. I drew the outline of the boat freehand. Cut out two matching pieces and stapled the sides, except for the top. This created a pocket for Jonah to fit into. I drew lines on the outside of the boat to represent wood. And then I took two popsicles sticks and glued them together in a Y shape as shown above. I cut out a sail and glued it onto the Y shape. I then glued the end of the popsicle stick inside the corner of the boat. I took all my scrap poster board paper and made a collage of land and sea. I glued everything together. I also placed glue on the land part and sprinkled some sand on top. Wonderful ideas. 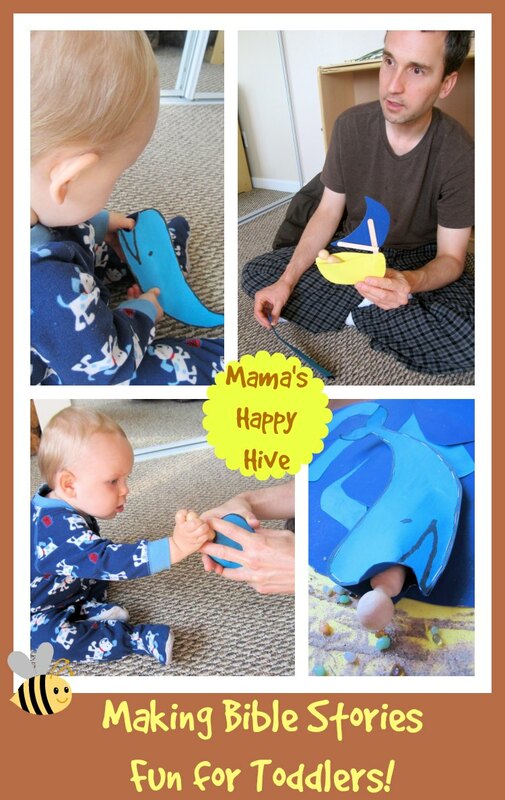 Your child will definitely benefit from all your thoughtful creativity and the time you devote to him! I LOVE this idea! It will be so easy to make it age appropriate for my kids. I pinned it and shared it! I love your ideas. Loved the sad face you put on Jonah – you are so creative with the sea rocks in the blue gatorade bottle! These learning toys provide a real, tactile guide to learning the Jonah story. I love easy ideas! Thank you for a great post. Pinned! What a cute idea! I love the two sensory bottles and all the details you put into them. I think that will really help kids understand the story. I love seeing Bible stories come to life in materials. Do you keep this available for your son on his shelf for him to play with and re-enact the story? Thanks for sharing about your facebook group too! Yes! In my latest post on the study of yellow it is on my Montessori shelves in a tray. We have been telling the story over and over again for Little Bee using these props. He loves it! These are awesome props! I was just thinking as I read your post that I probably don’t have a Lego whale big enough to swallow a Lego person, so my Lego method is out with this story. But praise The Lord, I can borrow your solution! 🙂 Blessings!